Michigan is said to have two seasons: Winter and Construction! Construction season is well underway in my hometown of Battle Creek. One of the projects in progress is a road construction project on Territorial Road. Territorial Road is one of the oldest roads in the area. It went from Southwest Michigan to Detroit about a century ago. The recent construction project unearthed logs that made up the road at this time. These logs were part of what is known as a "corduroy" road. 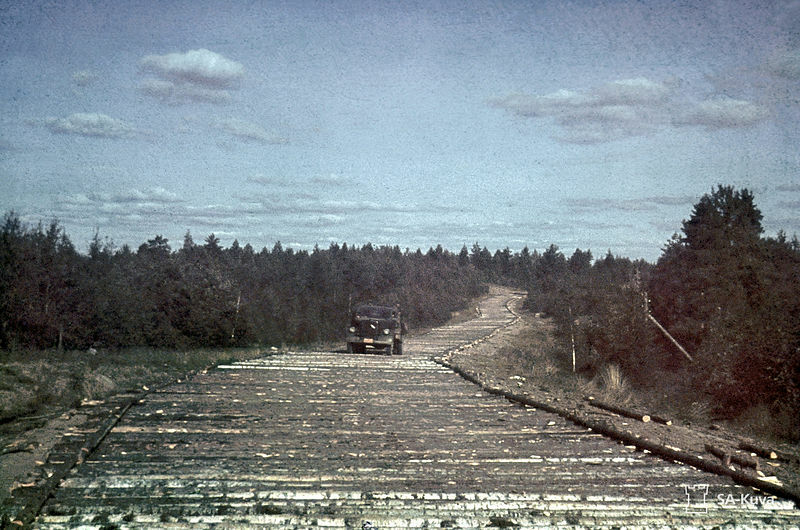 Corduroy roads were constructed of logs placed closely together and perpendicular to the road. They were called corduroy roads because of their resemblance to corduroy fabric. Corduroy roads were used to help riders traverse the often muddy conditions of roads. 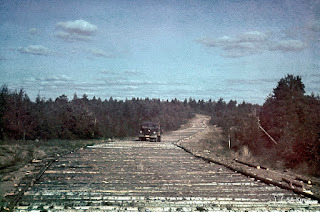 Many corduroy roads were torn up long ago. The unearthing of the Territorial corduroy road made for good news copy. The local news stations, newspapers and radio reported this information. It was even mentioned by the Battle Creek Regional History Museum's Facebook page. The history museum was seeking people who would be interested in preserving the historic logs. I thought I needed to see what the fuss was all about. The logs were stacked at the corner of Territorial Road and Woodrow Avenue. In the back of my mind I was thinking of ways I could incorporate one of these logs in to my landscaping. Holy Logs! These logs are huge. There would be no way to get the logs home, at least without my husband and I putting our backs out and a hernia or two. I had to be content to take pictures and blog about the unearthing of this historic Battle Creek Michigan road. Baaweting Anishinaabe Interpretive Center, 523 Ashmun Street, Sault Ste. Marie. The artifacts housed at the Center are donated by tribal members. Many of the artifacts on display have a story to go with it. The purpose of the center is to give visitors an understanding of their point of view and “Anishinaabe Bimaadiziwin” (native life ways). Andrew J. Blackbird Museum, 368 E. Main Street, Harbor Springs. This museum is on both the Michigan State Historical Site and the National Register of Historic Places. Native American artifacts can be found in what was Blackbird's house from 1858-1908. Eyaawing Museum and Cultural Center, 2605 N. West Bay Shore Drive, Peshawbestown. The center was established to preserve the history of the Grand Traverse Band of Anishinabek. Museum of Ojibwa Culture, 500 N. State Street, St. Ignace. Exhibits of Ojibwa culture and traditions can be found inside and outside at this museum. The museum site is registered as a Michigan State Historic Site (MSHDA), as a National Historic Landmark (NHL), is in the National Register of Historic Places (NPS) and is the 2011 winner of the Michigan Historic Preservation Network Community Award. Ziibiwing Center of Anishinabe Culture and Lifeways, 6650 E. Broadway Avenue, Mount Pleasant. Both a museum and cultural center, its mission is to share the history of the Saginaw Chippewa Indian Tribe and other Great Lakes Anishinabek. Are looking for resources that will further your research of your New England ancestors? I have found one you may not have thought of using for research. L. K. Mathews wrote, "The Expansion of New England: The Spread of New England Settlement and Institutions to the Mississippi River, 1620-1865" and it was published in 1909. New England Historic Genealogical Society republished it in 2012 and I bought a copy. I wanted to learn more about my New England ancestors and the times in which they lived. I knew that my colonial ancestors did not stay in Massachusetts their whole life, so where did they go? The Expansion of New England can help answer that question. The book helps to explain the migration of the early settlers and the reasons they may have moved. The book starts with the spread from the settlement of New Plymouth to the "first offshoots" to Massachusetts, to New Hampshire, Maine, and Connecticut settlements. Further migration continued up and down the Atlantic coastline and by inland rivers and streams. Eventually, migration sent settlers to New York, Pennsylvania, Ohio, Michigan, Wisconsin, and Northern Illinois and Indiana. It follows New England's westward migration to 1865. Mathews ten chapter book is filled with over 30 maps from the early 1600's to 1860. It tells the story of New England migration; the role religion played in migration, the travel patterns of whole communities, the effect of wars, the harshness of the wilderness, and the influence the settlers had on new settlements. The book is filled with additional sources that genealogist like to use. The footnotes alone are worth reading for research sources. Many of these sources will lead you to information about your ancestors and the places they lived. How did "The Expansion of New England" help in my research? I will use the Rowley family as an example. Henry Rowley came to New England around 1632 and settled in Scituate, one of the first communities to settle beyond Plymouth. He removed to Barnstable where we find him living in 1639. He dies by 1673, possibly in Succanesett. Henry's son, Moses, Sr. marries in Barnstable and purchases property, in 1677, in Succanesett, which later becomes Falmouth. In 1692, Moses, Sr. is in East Haddam, CT. Moses, Jr. lives most of his life in East Haddam. Jonathan Rowley, son of Moses, Jr., migrates to Kent, CT. His son, Jonathan, Jr. migrates to Pittsford, in Central Vermont, by 1773. Jonathan's Jr. son, Hopkins migrates to Shoreham, VT and his daughter, Huldah, migrates to the Michigan frontier in 1833. Most of this research was conducted using census, land, and probate records. Suppose you had Jonathan Rowley, Sr. in Kent, CT, but could not find his children. The Expansion of New England can help. In fact, the Rowley family migration mirrors the migration pattern found in this book. Or suppose you have Hopkins Rowley in Vermont in the early days of Vermont's settlement, but have no clue where he came from. The Expansion of New England could help you explore new areas. In fact, I did a little reverse research using the information in this book on Jonathan Rowley, Jr. I knew Jonathan Jr. was born in East Haddam, CT, in 1729. The next record I found for him was a land purchase in 1773, in Pittsford VT. Where was Jonathan, Jr. during these forty four years? Using the information on migration patterns in Mathews book, I discovered a migration pattern from eastern CT (East Haddam) to Western CT (Kent) to towns in the Berkshire Mountains migrating to Central and Northern Vermont. Can you guess where I went looking for Jonathan, Jr.? Yes, the Bershire Mountain area. It is from Richmond that Jonathan Jr. migrates to Vermont, just as the book says. This is only one of many migration patterns discussed in the book. Migration patterns from New England to the Mississippi River are provided. I have started looking for my Fenn ancestry using the information on migration patterns in this book. I have Daniel Fenn, who married Huldah Rowley, in Vermont. Could Daniel be found in the Berkshire Mountain area, Western Connecticut, or Eastern Connecticu? If the genealogical gods align, he will be found. A family history researcher may not pick this book up to read thinking that it wouldn't advance ones research. The researcher would be missing out on a well researched and written book. 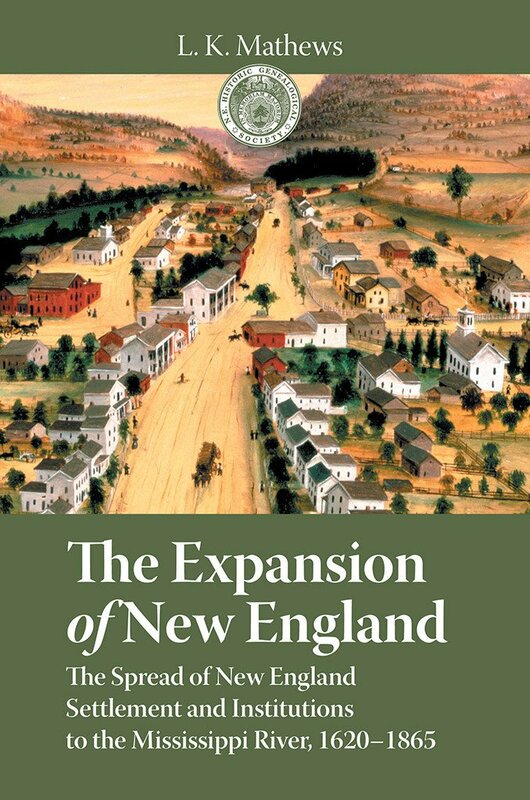 "The Expansion of New England" is an excellent book to read whether you have early New England ancestors or not and if it furthers your family history research, it is a win-win. Source: May 16, 1945 Battle Creek Enquirer page ten, column one "News of Our Men in the Services." Former Ship Lost- the ship on which Jim Tyson, signal mate third class, served until July, was announced as sunk by enemy action yesterday. It was the minesweeper YMS 103. 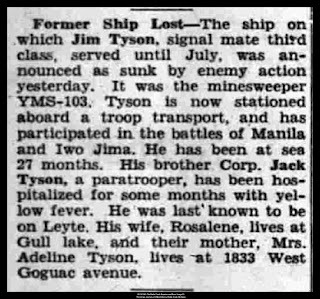 Tyson is now stationed aboard a troop transport, and has participated in the battles of Manila and Iwo Jima. He has been at sea 27 months. His brother Corp. Jack Tyson, a paratrooper, has been hospitalized for some months with yellow fever. He was last known to be on Leyte. His wife, Rosalene, lives at Gull Lake, and their mother, Mrs. Adeline Tyson, lives at 1833 West Goguac avenue. Can you imagine being a service person and learning that the ship you had been serving on was sunk? That is what happened to my dad's first cousin, James Tyson. The article above informs the readers of James' hometown, Battle Creek, about it. The Battle Creek Enquirer had a regular column, "News of Our Men in the Services" that was published during World War II. The articles focused on area service personnel news. I have conducted research using newspapers from various areas during World War II. The one thing I have found in all of those papers is the patriotic spirit of the hometowns. The articles are a wonderful history of the time and the support the community had for the young men and women who were serving at the time. I have found these articles helpful with my family history research. The articles add details to my family history that I might not find elsewhere, easily. 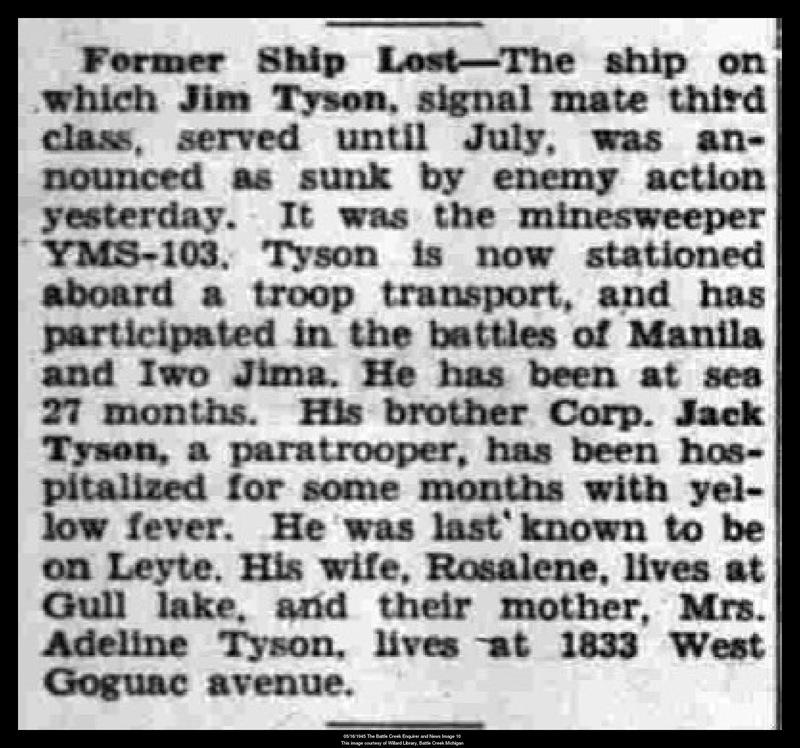 This article tells me about his former ship, where James is stationed now, the battles he participated in, how long he has been at sea, his brother's name, his brother's illness, and family ties. James Victor Tyson was the son of Victor Tyson and Adeline Glover Tyson. He was just 20 years old at the time of this article. I am still trying to get my ducks in a row for my New England trip that is coming up faster than I think I will be ready for. My latest plan is to get together all the information I need for the repositories I plan to visit. This will allow me to make sure of the dates and times they are open and if I need to make appointments. Reading about tips for preparing for a visit. The first item on the list is "make a list." I love making lists! Checking what resources are available. Checking what databases are available onsite. Searching the card catalog and creating a list of resources. Collecting items on the what to bring list. Checking out the policies and procedures for visiting. Finishing up my research plans and logs. Reading the website section on the Leahy Library. Checking the location and hours. Searching the card catalog for resources. Searching the manuscript collection online. Requesting certain resource ahead of time, if warranted. Checking PERSI for any Vermont periodicals that are available at the library. Checking Genealogy Indexes and Lists section on the website. The Shoreham Historical Society and the Pittsford Historical Society are two societies that I want to visit when I am in Vermont. I will be reading their websites further and contacting them regarding a visit. Technically, cemeteries are not repositories but I will be making a list of the grave-sites and cemeteries I want to visit, including the Ben and Jerry's Flavor Graveyard and the Von Trapp Family Graveyard (no relation, just love the Sound of Music). I know I won't get to all the cemeteries I would like but I will be prepared with location information before I go. I have my cemetery bag ready to go, I just need to make sure it gets in the car. 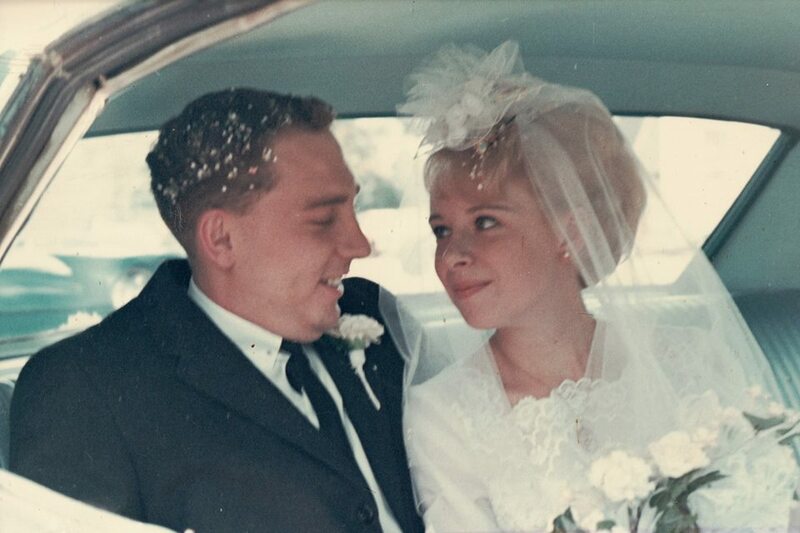 A wonderful couple, Mary "Mari" Elizabeth (Grischow) and Ernest "Ernie" Charles Pearce are celebrating 50 years of marriage today! Congratulations Mari and Ernie! I met Cousin Mari, and her husband, Ernie, four years ago after I made contact with Mari on a genealogy message board. She was looking for information on her grandmother Emma Fredrick, who is my grand aunt. Emma Fredrick was the sister of my grandfather, Otto August Fredrick. Emma and Otto's parents were Johann August Fredrick and Louise Fredrike Zastrow. Shortly after our online contact, Mari and Ernie traveled to Michigan, from Ontario, to visit. It was then I met Mari and Ernie in person and found a wonderful cousin. We sat at the dining room table and shared stories and pictures. We have continued to share family information over the past few years. Mari introduced me to a part of the family I knew nothing about. It wasn't long before Mari and Ernie were welcomed into the Fredrick(s) family. Mari and Ernie returned to Michigan to attend the Fredricks family reunion and met more cousins than one could imagine. It is my pleasure to wish Mari and Ernie my congratulations on their 50th Wedding Anniversary. They are a wonderful example of a lasting marriage and I wish them many more years of happiness and love. Mary 'Mari' Elizabeth Grischow married Ernest 'Ernie' Charles Pearce on 16 July 1966, at the Knox Presbyterian Church, Acton, Ontario, Canada. Rev. Andrew McKenzie officiated at the 2:00 p.m. Saturday afternoon service. Mari is the daughter of Audrey Bessie Chalmers and Boots Grischow. 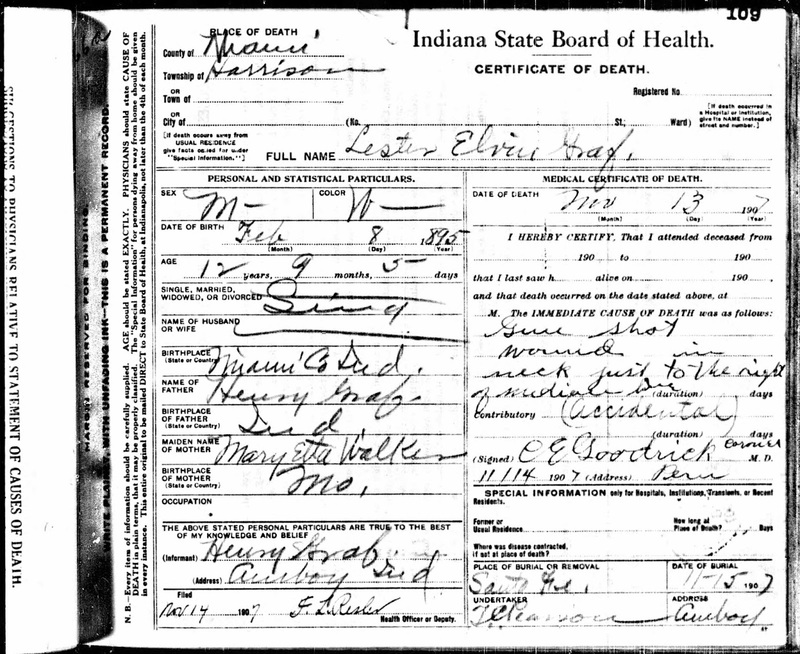 Death Certificate of Lester Elvin Graf, son of Henry Graf and Mary Etta Walker, who died of an accidental gun shot wound. "Indiana Wants Me" Who remembers the song from the early 1970's? It is what popped into my head the weekend I discovered all the new Indiana Record groups that became available online at Ancestry. I believe Indiana wanted me to search for the hundreds of Indiana family members I have. I didn't have any luck with the birth certificates as most of my ancestors were born before 1907, but I may be able to go back to the records as my research continues with finding the descendants of my ancestors. The marriage certificates were of no help to me at all as I knew of no one who was married in Indiana after 1958 in my family tree. The death certificates were a gold mine. I spent hours and hours going through the records and found over 100 death certificates for my Graf and Mast families. I found new spouses which led to new records. The records at Ancestry are wonderful as they show the actual certificate, but there are a few issues with searching them. I found a number of certificates that were indexed to the person, but the image was of someone else's death. I found if I went back, or forward, a number of images, I could find the correct certificate. This led to me sending a lot of correction information to Ancestry. It made it difficult to save the image as the correct certificate was indexed under another name. Hopefully, Ancestry will get this fixed soon. Now, I just have to go and record all the certificates to my Roots Magic software program and source them. These are the newest Indiana records available at Ancestry. 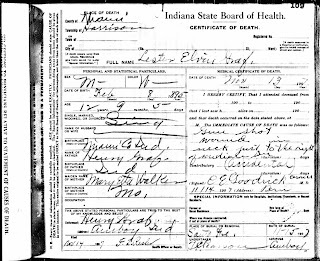 For a complete list of Indiana records on Ancestry check here. Don't forget if you don't have a subscription to ancestry many libraries have access to the library edition that you can use for free at your local library. Happy Hunting! Society Pages are great genealogical finds. A researcher can find so much about their ancestors when they are featured in the society pages of a newspaper. I don't know when publishing society news went out of style, but I am sure it had to do with privacy concerns of individuals. The smaller the newspaper the juicer the gossip in my finds. I remember when I was in high school and reading my local newspaper, The Harbor Beach Times, there was all kinds of society news, who was having and hosting bridal showers, who was traveling where, who returned home, who was in the hospital and more. Many local newspapers did the same. The above society note is from the Jackson Citizen Patriot, found at Jackson District Library, Jackson, Michigan. It is from their 23 Oct 1897 edition. 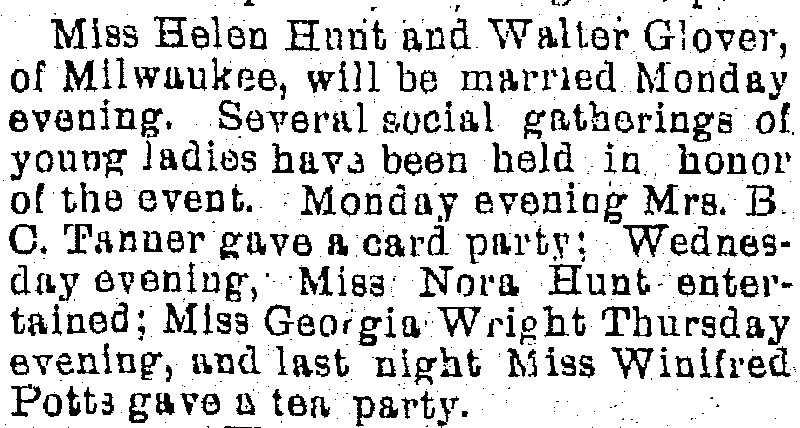 The article tells of several social gatherings that my great grand uncle's, Walter Glover, soon to be wife, Helen Hunt, had before her wedding. 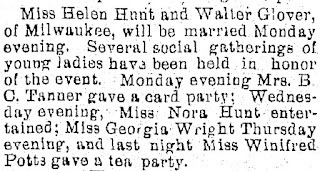 Helen Hunt was honored with four events the week of her wedding; a card party, a tea party and two evenings with friends. These articles provide a glimpse into our ancestors lives. It doesn't give any vital record information, but it helps see a picture of the couple and provides names of friends and acquaintances that may lead to more clues about ones ancestor's life. Be sure to check local society news for glimpses into your ancestors life. You may be surprised by what you find. 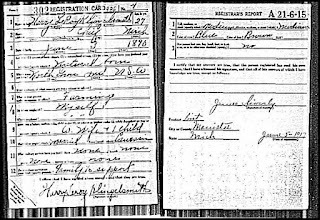 "World War I Draft Registration Cards, 1917-1918," [database on-line], Ancestry.com (www.ancestry.com : accessed ), Entry for Harry LeRoy Klingelsmith; number 4; United States, Selective Service System. World War I Selective Service System Draft Registration Cards, 1917-1918. Washington, D.C.: National Archives and Records Administration. M1509, 4,582 rolls. Imaged from Family History Library microfilm. The record doesn't state the wife of Harry, but Harry Klingelsmith married my grand aunt, Maggie Graf, on 21 November 1916 in Manistee, Michigan. Harry signed this registration on 5 June 1917. Harry and Maggie had one child, Doris, at this time. This is the family that Harry is claiming he has to support. Harry was 27 years old and living in Chief, Michigan. Chief is a very small place in Manistee county, Michigan. World War I draft registrations can be filled with information. The piece of information that I appreciated having from this record was his birth date, 3 June 1890, and birth place, North Grove, Miami, Indiana. One would hope that this information is accurate because Harry provided the information. One would still want to find a primary record of his birth to verify it. Harry died at the age of 70 and is buried in Brethren Cemetery, Brethren, Michigan. To my knowledge he never fought during WWI. Some of you may know that my parents are aging, ages 86 and 91, and I have been helping them with a few chores every week. Of course, this gets me thinking that they will not live forever. These thoughts were my motivation to have my mom's and my dad's DNA tested. I chose to use Ancestry DNA. I ordered four kits (two for my parents and two for my in-laws). I had them perform the test, sent it in and waited. I was surprised that I had all four results within a month. I can tell you that everything stopped the minute I saw the email that said my DNA result was in. My mother, Audrey Fredrick Glover, was the last result to come in. Of the four DNA tests that were taken, I figured my mother's would be pretty easy to predict, Eastern and Western European. My research of my mother's surnames-Fredrick and Graf, led me to Prussia, now Poland area, Palatinate area of Germany, and Switzerland. Imagine my surprise when her results came back 42% Great Britain. It is an estimate based on the best science can do now. It goes beyond what genealogists can find as recorded family history. My mom is 98% European, less than 1% Asian, less than 1% Middle East, and less than 1% Asia South within this time period. I have to think of the results as broad regions, not countries. I have to think of it as having two trees: one my genealogy tree and the other my DNA tree. I have to keep reminding myself of this. Next, I looked at the Ancestry DNA matches. My mom had one first cousin match. Actually, she is my mom's niece's daughter and I know her quite well. My mom had four second cousins, only one with a tree, and I don't know any of them. I am still going through the information, but I have starred five to look at further. 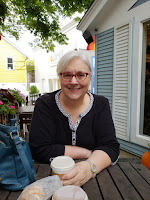 A few of the surnames that I have found a connection to my mom's DNA include Mast, Fredrick, Graf, Livengood, Hershberger, Forney, and Seese. I think I am on the right track with my research here. I still have a lot of work to do to understand all the results and how it will help me in my research, but I am so glad I have my parent's DNA and can continue to learn more about my family history through it. Many of my readers know that I became involved in family history when my dad started writing his autobiography and didn't know a lot about his dad's, Harry Glover, side of the family. I told my dad I would see what I could find; little did I know I would be addicted to researching the family history. This was in December 2006, almost ten years ago. I am happy to say that my dad's autobiography is done! It is printed and is in the process of being shared with family members. It was quite a process for my 91-year old dad. He used Microsoft Word to write it and went through a couple of computers, lost part of it, and lost Microsoft Word somewhere in the process. Luckily, he had printed out copies of the book as he wrote it and I was able to use Dragon Dictate to get it ready to publish. The biggest decision for my dad was to decide how to get it published. He attended a self publishing event at his local library, went to the local printers and researched online. It wasn't until a friend of his told him about Diggy Pod, that the decision was made. Diggy Pod is a small self publishing company in Tecumseh, Michigan, my home state. I cannot say enough good things about Diggy Pod and their customer service. From the first time my dad called them until the package arrived at his doorstep, they were terrific. The quality of the book exceeded my dad's expectations. Sample-a generic sample will be sent upon request that shows paper options, print quality, etc. Up front pricing- you know exactly what it will cost from the beginning, no surprises. Cover options- makes it easy to create a cover on your home computer without graphic design experience. Sizes-nine sizes of finished product are available, from 4"x 6" to 8 1/2"x 11". Color-Black and white and color page printing is offered. Templates-provided and easy to use. .pdf-software for converting Microsoft word document to .pdf format is provided free of charge. Quality-so many levels of quality. Diggy Pod provides their own quality check before final printing. Proofs-online proofs are provided before final printing. Website-everything you need is on their website to guide you through the process. Real easy to work with person-telephone and email support is available and it is an actual person. 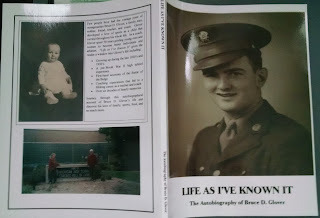 My dad's autobiography, "Life As I've Known It" was written using Microsoft word. Upon completion, I downloaded it to my computer and did the technical side of things; spell checking, margins, justification, headings, page numbering, etc. I added a genealogical section to the copy and added family pictures. I created the front and back cover copy. Once it was ready to print I converted it to .pdf format and ordered it. I did make two mistakes. One, I knew about before hand and didn't double check it. I had the page numbers right justified instead of center justified. The reason this is important is because the pages are done in mirror images of each other and the left hand page has a page number on the lower right hand side. Diggy Pod let me know of this mistake, but it would have cost an additional $40 to submit it correctly and I decided it was okay where it was. The other one is kind of comical now that it is over with. My dad had a good friend of his write a forward to the book. I was going through pictures, looking for one of my sister and my dad, and I came across a picture of his friend. I thought it would be nice to include that picture on the page with the forward. Nice idea, wrong friend's picture! Talk about embarrassing, on my part, when my dad got the book and saw it wasn't the right picture. I was able to fix it by making copies of the right picture, printing it on sticker paper, and putting it over the other picture. All is well, now. My sincere apologies, Dr. Hartman! The final product was a paperback, 8 1/2 x 11, black and white book with 133 pages in it. The final cost, including shipping, was around $10 a book. A great deal in our opinion. My dad was very pleased with the quality of the book. The service was fast. It took less than two weeks from sending the files in until my dad received it. My dad doesn't think anyone would want to read it outside of the family. I am trying to get him to donate it to Hazel Park(MI) Historical Commission Library, he grew up in Hazel Park and talks a lot about his early years there. Also, I would like to see a copy in Allen County Public Library, Fort Wayne, Indiana. This autobiographical account of Bruce D. Glover’s life will show his love of family, sports, food, and more. I was happy to help my dad see his project to completion. 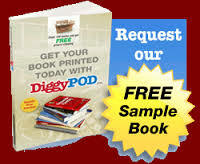 It is a wonderful example of a well written family history book and we can thank Diggy Pod for being so easy to use. If you are looking for a quality book publishing service, with great prices and excellent customer service, look no further: Diggy Pod is all you need! Cephise Albertine Glover, the daughter of Charles Williamson Glover and Mary Ann Powers, was born 15 March 1846 and died 28 February 1853, according to Glover Family Bible Records found at Ypsilanti Historical Society, Ypsilanti, Michigan. She is buried in Highland Cemetery, in Ypsilanti, in Lot 21, Block 10, the same lot as her parents. Cephise was almost seven years old when she died. 1853 was before Michigan began keeping death records and I don't know her cause of death. The gravestone is almost covered with earth. It is almost impossible to read and if it wasn't for the sexton records at Highland Cemetery, I would not have known that this was Cephise's grave. ACTON-One of Acton's most colorful personalities, a former Reeve, and veteran of the Spanish-American War, James Burnett Chalmers died at his home here on Friday. He would have celebrated his 91st birthday in April. Members of Walker Lodge, AF and AM, conducted a memorial service on Sunday evening and funeral service was held on Monday afternoon from Rumley-Shoemaker funeral home, with Rev. Andrew McKenzie of Knox Presbyterian Church, officiating. Pallbearers were Cliff Bradley, Tom Watson, Rudolph Speilvogel, Lorne Norton, Mike Coxe and Sam Holmes. Interment was at Fairview cemetery, Acton. "J.B" as he was known to a wide circle of friends was the son of Catherine Burnett and John Dobson Chalmers. Born at Lethnot near Montrose in Scotland, he was 12 years old when the family immigrated to Canada, settling first in Halton county's Scotch Block, and later moving to Owen Sound. As a young man working in the United States, at the outbreak of the Spanish American War, heeded the call of adventure and volunteered for action with the American Army. He was married in Toronto to Emma Frederick, who predeceased him in 1955. A resident of Acton for over 35 years, Mr. Chalmers was an expert plumber and tinsmith. He made a successful bid for municipal office serving first as councilor and in 1940, he was elected to the position of reeve, which he held for two years. 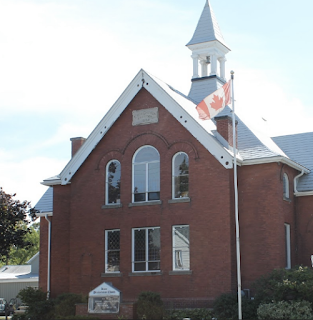 He attended Knox Presbyterian church and held life memberships in the Masonic Order for Orange Lodge and Acton Legion. A past master of Sault Ste. Marie Lodge. Mr. Chalmers affiliated with Walker Lodge, Acton, in 1927, and was presented with his Jubilee Medal eight years ago. After his retirement, he devoted much of his time to the hobby of making model ships and boats, designed to scale and finished with superb craftsmanship. One of his favorites was a replica of the Bluenose and he also constructed many miniatures of Great Lakes freighters, old schooners, yachts, gun-boats and paddle wheelers. A little workshop in the garden was a fascinating store-house for glue pots, bits of lumber and partially finished models crowding the work bench. Here, in the fine weather, "J.B." and one or two fellow hobbyists spent long enjoyable hours swapping yarns of the sea, and debating lines and scales of craft they planned to build. Almost every ship was fashioned with a relative of friend in mind. One of the Chalmers' models decks a mantle above the fireplace at Acton Scout hall, and another displayed prominently in the foyer of Robert Little public school. In appearance and personality, James Burnett Chalmers was an artist or photographer's delight. ruddy-complexioned, and white haired, he wore his years with grace and humor, that twinkled from shrewd blue eyes. An accomplished raconteur, he loved to reminisce about his boyhood in the village of Lethnot and his experiences as a soldier in the Spanish-American War. Of recent years, Actonites grew accustomed to the sight of Mr. Chalmers seated on the side porch chatting in the sun, with a neighbor, Charles Withers, veteran of the Boer War. The main topic of their daily chats rarely varied; invariably, the conversation veered around to military tactics, and memories of the two wars in which they served. also a regular visitor at the Chalmers' home was another neighbor, Father V. J. Morgan, of St. Joseph's Roman Catholic Church, with whom J.B. enjoyed discussing a variety of topics from international affairs to politics. Until a few year ago, Mr. Chalmers was a familiar figure at Remembrance Day parade and services. He is survived by one brother, Robert, of Owen Sound; a son Robert, of Bythe; and five daughters, (Catherine) Mrs. Douglas Bell, Guelph; Mary, of Toronto; (Oral), Mrs. Stan Norton, Acton; (Margaret) Mrs. John Valby, Winnipeg; (Audrey) Mrs. Boots Grischow, Acton. There are 12 grandchildren and eight great-grandchildren. Mr. Chalmers resided with his daughter, Mrs. Stan Norton, at 50 Church St. Acton. James Chalmers, my grand uncle, has an obituary that every researcher would love to find on their ancestor. It is filled with tons of information that allows the reader to get to know him. 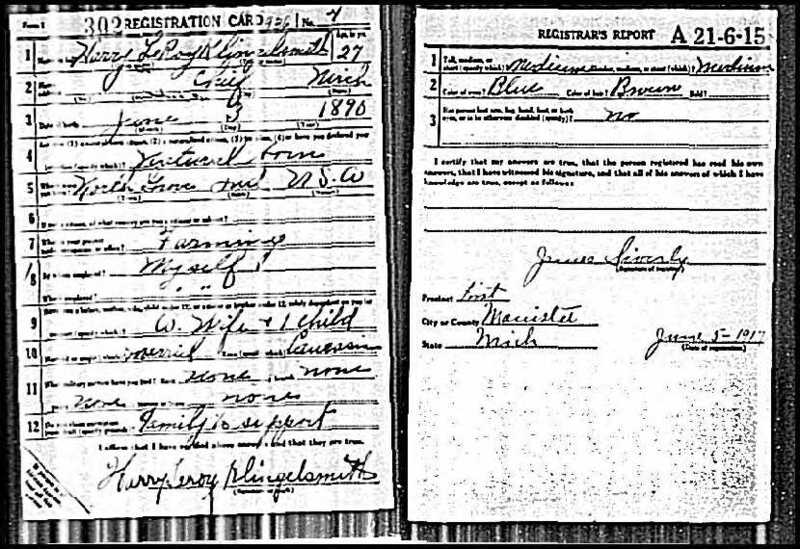 James' military history, memberships, immigration, occupation, office holder positions, church membership, hobbies, and specific birth place information-all a genealogist's dream! And if that wasn't enough it even provides a description of his looks. James Chalmers married Emma Louise Fredrick, the daughter of J. August Fredrick and Louise (Zastrow) Fredrick, 6 June 1905. Thank you to Cousin Mari, for sending me this wonderful obituary on her grandfather. Date bread, date squares, coconut date balls, date pinwheel cookies, bacon wrapped dates, fresh dates, dates, dates, and more dates are one of my favorite foods. I can eat just about anything if it includes dates! One of my favorite cakes as a child was one that my mom used to make. It is called "Picnic Cake" and, of course, it has dates in it. I don't know the origin of this cake, but it is a family favorite. I have made it numerous times for my family. I hope you enjoy it. Add 1 teaspoon baking soda to 1 1/2 cups boiling water. Pour boiling water, with soda added, over chopped dates. Let Cool. Add dry ingredients to wet ingredients. Stir to combine. Add dates with the water to this and stir until mixed well. Do not over beat. Pour into 13 x 9 inch pan. Sprinkle over top of cake.